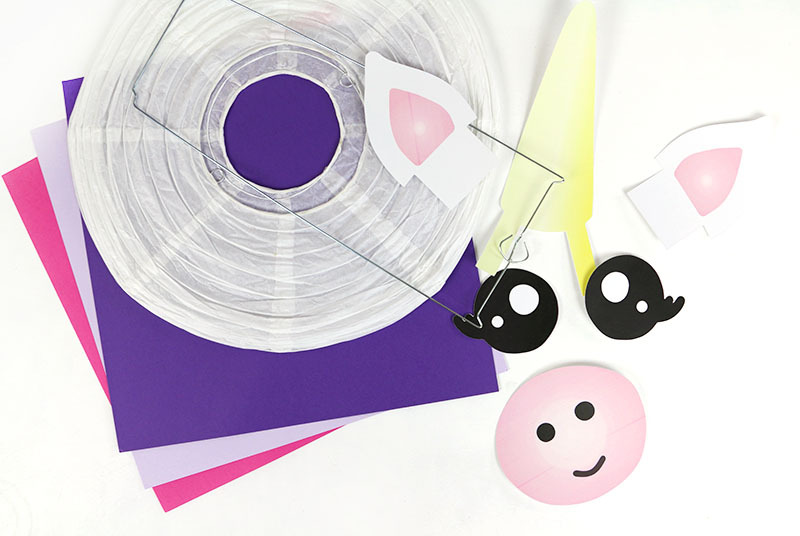 These DIY Unicorn Paper Lanterns make magical party decorations or cute additions to any unicorn themed bedroom or event! 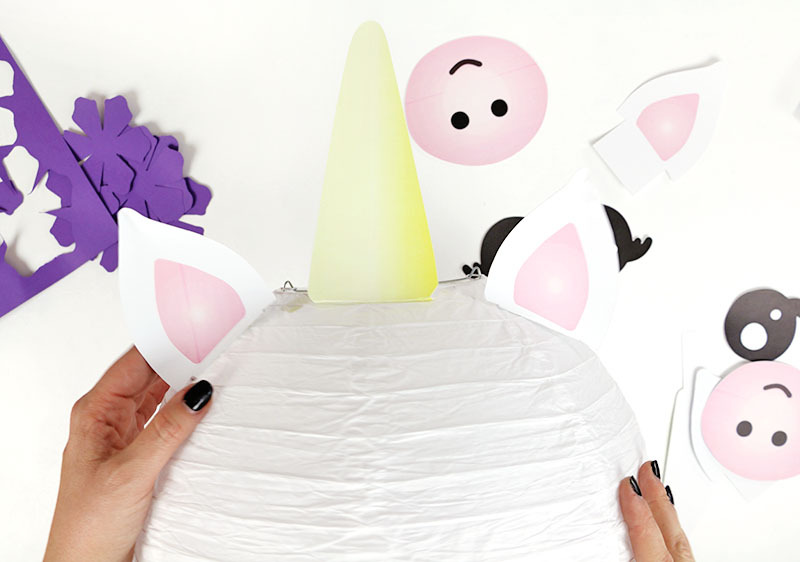 Make your own unicorn lanterns easily with my free printables. This post contains affiliate links, which help to support this site at no extra cost to you. Thanks! BUT – be sure to go check out the whole party because there were some really fun little details including some really fun party activities! 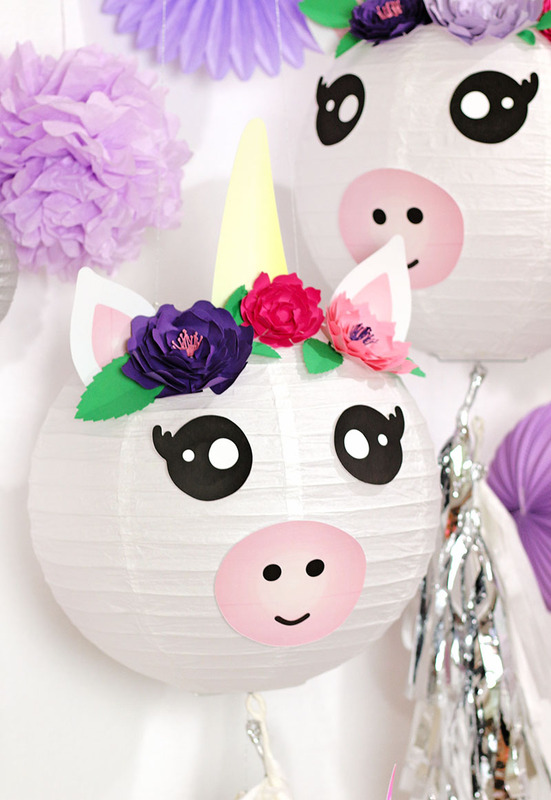 Some of my favorite DIY decorations for the party were definitely these little DIY Unicorn Paper Lanterns. 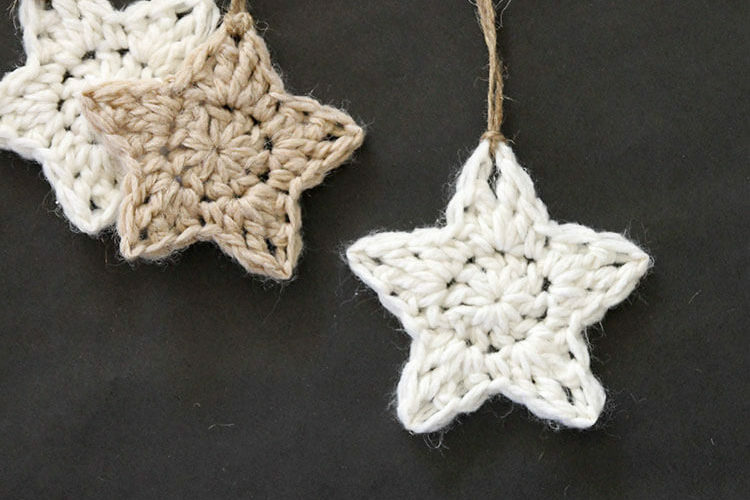 The great thing about them is they are really inexpensive to put together, they pack a big decorative punch, and they are just so cute! If you want to make some for your own unicorn party, then I am here for you! 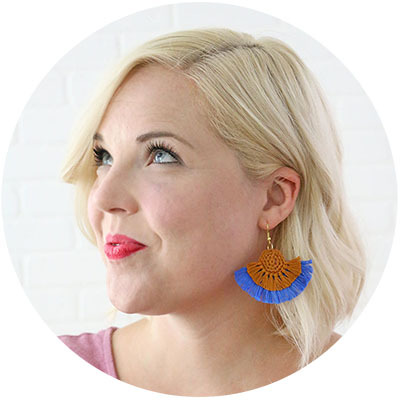 I have everything you need including some free printables to make it extra easy. Paper Flowers made with colored cardstock (I used designs from the Silhouette Store) or Faux Florals would work great too! First start out by printing off the unicorn face pieces PDF from the supply list above on nice, thick white cardstock. Then cut out each piece by hand or using an electronic cutter if you have one. I used my Silhouette’s Print and Cut feature to cut out my pieces. Once you have your unicorn pieces printed and cut, assemble your lantern by inserting the rectangular wire piece through the top opening and locking the tabs on the one end of the rectangular piece into the eyelets at the top of the lantern. 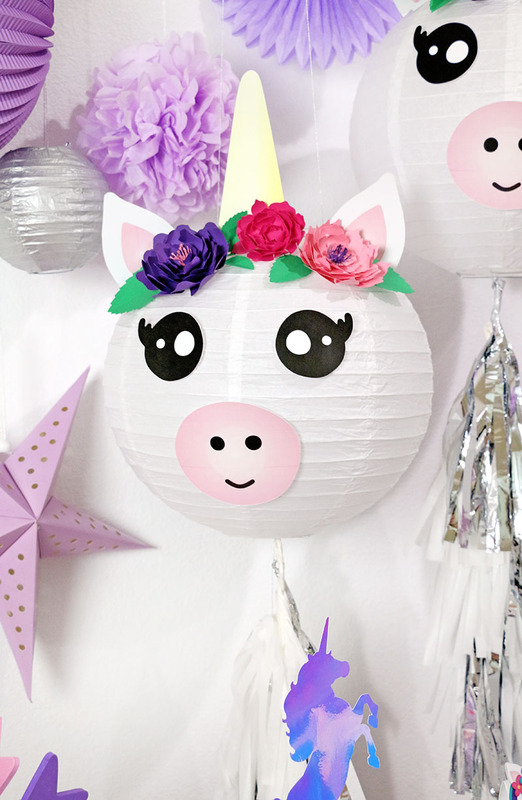 Next, use your hot glue gun to attach the unicorn face pieces to the lantern. You will need to fold back the tabs on the ears and horn to help them attach properly to the lantern. Be careful not to burn yourself with the hot glue through the thin paper. Next, we will add some pretty flowers around the unicorn horn at the top of the lantern. I used paper flowers I made using my Silhouette and some brightly colored cardstock, but you could also use faux flowers for a simple and pretty solution. At this point, you could be done if you like, but I decided to add one more little touch with some tissue and mylar tassels. 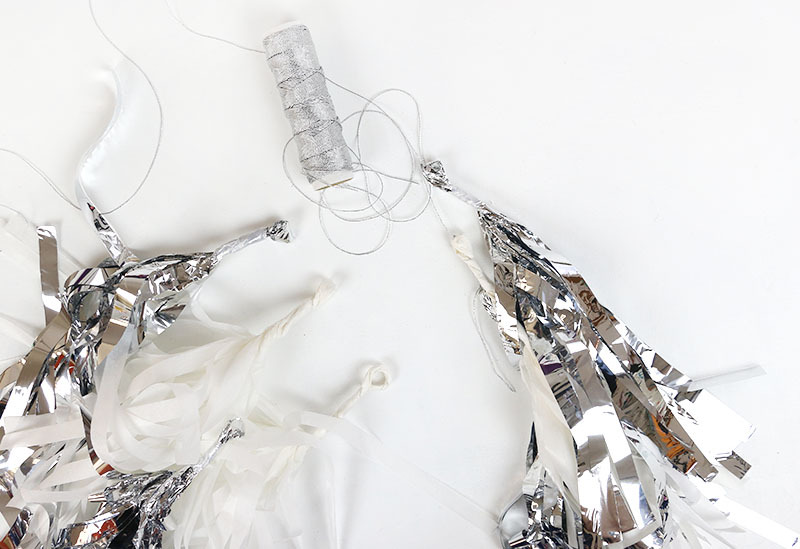 I used this kit to make my silver and white tassels and then tied them to the bottom of the lantern. I really love the way these look hanging from the lantern. It reminds me of a unicorn mane or tail. 🙂 At this point, all that’s left to do is hang your lanterns and enjoy! Because the unicorn lanterns have more weight on the front of the lantern, they do tend to tip forward a bit. If you are a little bit of a perfectionist like I am, then you might want to put a little weight on the backside of the lantern to offset that, but it’s not really necessary. 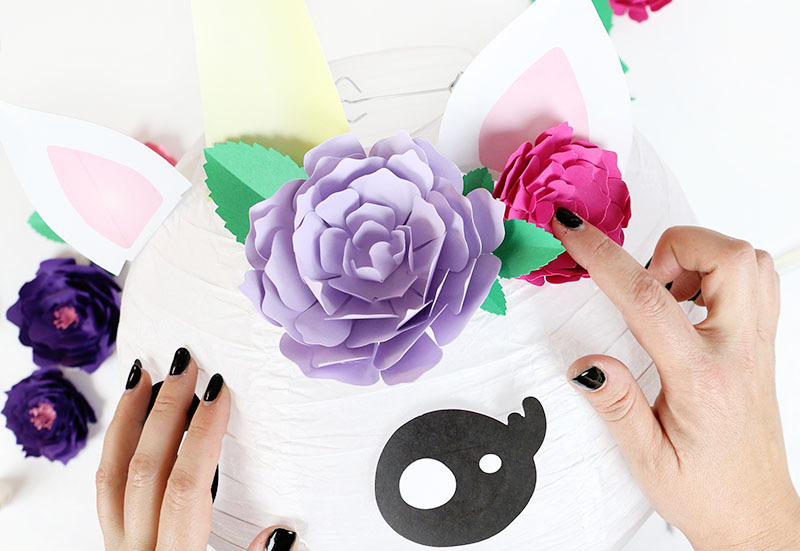 If you make your own DIY unicorn paper lanterns, then I would LOVE to see them! You can share your pics to my facebook page or tag me on instagram. ? 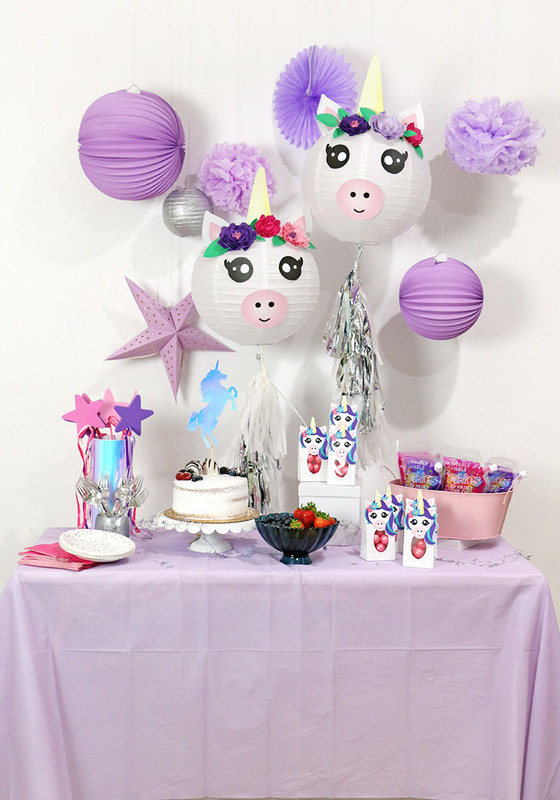 Having a Unicorn Baby Shower in May and will definitely be doing these Unicorn Paper Lanterns. 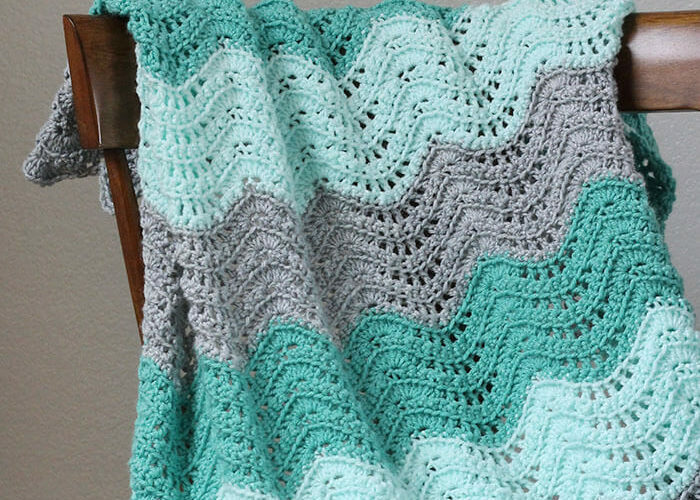 Will post pics in May!